Colonial Knives Tat Cutter–TSA Compliant? At the Blade Show 2013, I had a chance to trade ideas with Steve Paolantonio, the owner of the Colonial Knife Company. There was a banner at the back of the booth proclaiming: “Colonial Knives Tat Cutter–TSA Compliant.” Or words to that effect. I was curious, since I had just flown in sans sharp objects. Mr. Paolantonio showed me the little rescue hook. He said the marketing of the cutter was purely by accident. Paolantonio said he loves the outdoors and is a rock climber. To save on weight, he disassembled a Colonial Rescue Hook Auto Tool and hung the steel cutting portion on some ball chain around his neck for clambering about on the vertical faces. During a sales meeting with a distributor, Paolantonio confessed that the rep was ordering catalog items, when she saw the jewelry on his neck. She said, “…and I’ll order some of those, too.” He was puzzled, until he realized she meant the rescue hook he was wearing. Thus, the Tat Cutter became one of Colonial’s products. The Tat Cutter is Made in the USA. The hook is 0.110″ thick 440C stainless steel, Rockwell hardness 58-60. 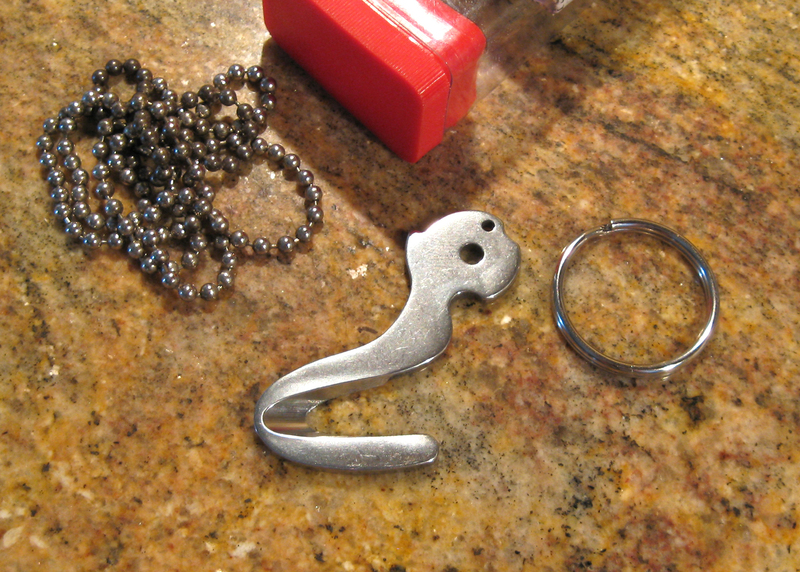 The key ring is provide, but the ball chain is not. Colonial has also come out with a Tat Cutter with a removable pocket clip. For uses, Mr. Paolantonio says he draws on the Tat for slicing box tape, severing plastic ties, and opening snacks on the plane. It can be similarly used on seat belts, rope, and webbing. 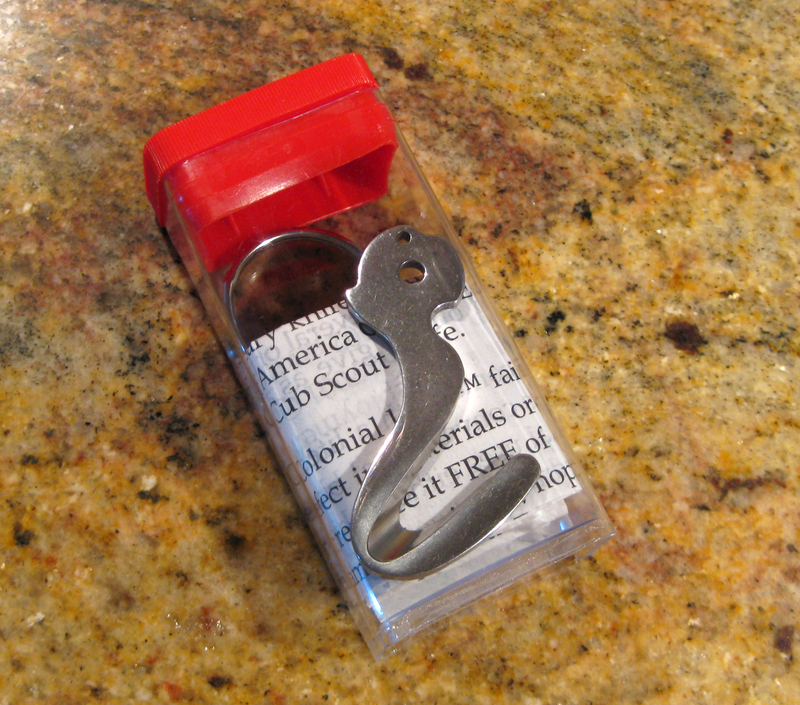 The pocket clip model can be employed as a money clip. 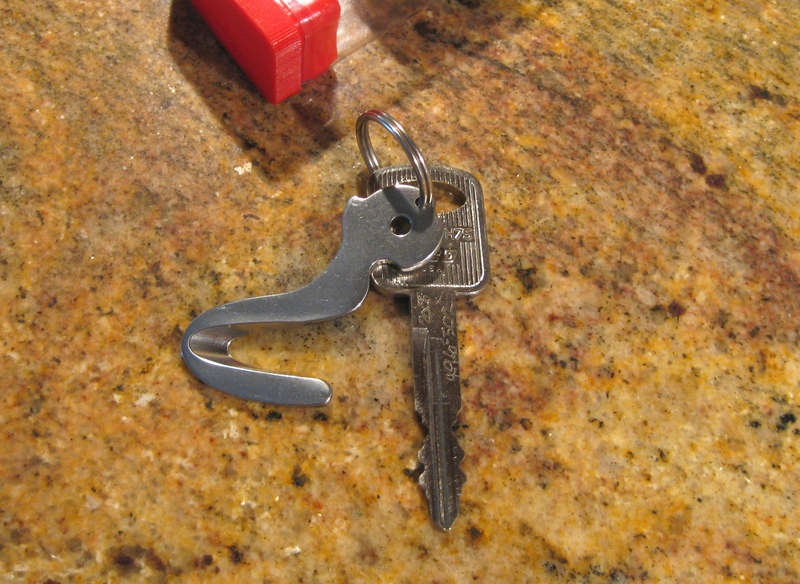 As to his challenge, the Tat Cutter was threaded on my key ring, which was placed inside my carry on bag when I went through Hartsfield-Jackson. It sailed through TSA without a problem. TSA compliant? I’d call it TSA-unnoticed for now. Since scissors with blades less than 4″ are allowed in carry on bags, I think the 1/4″ protected cutting surface of the Tat Cutter is less of a threat. I think it is a nice emergency tool for less than fifteen bucks. This entry was posted in Knives and tagged Blade Show 2013, Colonial Knives. Bookmark the permalink.